The inspiration for my work is Ancient Egypt. The Egyptian Galleries contain my paintings, photographs and sculptures. You will also find valuable information about Ancient Egypt. Please, go to the gallery that you find the most interesting. I hope your trip through my galleries is enjoyable, please share your thoughts and ideas with me by or join me. In this gallery you can view photographs of some of the ancient Egyptian monuments and artifacts that have captured the imagination of the world. This is a beginner’s guide to the fascinating world of Egyptian myths and legends. It includes pictures and descriptions of the gods and goddess some of the most frequently used symbols and excerpts from the papyrus known as The Book of the Dead. Do you need to know about that ancient Egyptian what-do-you-call-it, this is the place to find it. This is a great resource for information about ancient Egyptians lives. Thanks to Ms. Henderson’s global studies class for finding this. Learn about mummies, how and why they were made. Meet Mumab I, the first mummy to be made using the ancient Egyptian recipe in nearly 2000 years. This is another Egyptian Ministry of Tourism page, a wonderful chronology. This is a comprehensive list of the kings of ancient Egypt. this link will take you to the Egyptian Ministry of Tourism’s pages. 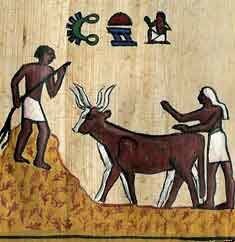 A picture is worth a thousand words, try building your own words using the ancient Egyptian picture language. Some of these pages have a lot of symbols and may take awhile to load. This gallery contains photographs of life along the Nile River as it was in 1996 A.D. Keep in mind, some parts of Egypt haven’t changed much since the time of the pharaohs. Take a tour of Egypt using maps and my color photographs. Tour a temple, tour a tomb, or take a cruise up the Nile. It’s almost like being there. Visit my home at Pyramid Acres and see my latest projects. Check out My Sarcophagus, the coolest piece of furniture ever. Or you may like to read my Resume, Artist Statement.You will want to browse my library, have a look at some Egyptian themed games or see my movie or poster collections. In this gallery you can view my paintings. They are a humorous look at our modern world as it might appear through the eyes of the ancient Egyptians. I think you will see why I call this the Time Warp Gallery. Here, you can view six of my favorite pieces, now being sold as limited edition lithographs. These prints are sold and displayed in restaurants, bars, museum shops, galleries, and private collections around the United States: most notably, The Walters Art Gallery in Baltimore, MD; The Luxor Hotel in Las Vegas, NV; and the Hard Rock Cafe in Myrtle Beach, SC. There are now satisfied collectors residing in 36 states and 9 countries, including Egypt. See the fashions that were in style 3500 years ago.Take a look at the architecture and decorative motifs and furniture of the ancients. Some of my most rewarding experiences happen when I am talking to school children about Egypt, they are fascinated with the subject. Occasionally, the children give me drawings and share their ideas with me. In this gallery you can see the artwork of some of these talented young people.Check out the new Children’s Mural page.